In the last six or eight months, there seems to have been an incredibly large number of new books published on Tolkien. It's been impossible for me to keep up with them. I'll cover a number of them in future columns, but for now, here's a quick look at the best ones I've encountered so far. Yes, yes, these recommendations are way too late for Christmas, but if you're an obsessive Tolkien fan, and you haven't gotten these yet, they are definitely worth your time and attention to seek out. 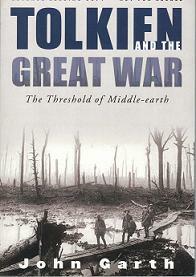 Tolkien and the Great War: The Threshold of Middle-earth ($26.00 Houghton Mifflin hardcover, ISBN 0618331298), by John Garth, is billed as a substantially new biography but that's misleading. It's really a partial biography, concentrating on the years from 1913 through about 1920, centering on Tolkien's involvement in World War I and how that was formative in the development of Tolkien's mythology, especially the early "Book of Lost Tales" material. There is a lot of new information in here, particularly about Tolkien's schoolboy friends and their activities leading up to and during the war, and frankly this at times get to be a bit much. The best part of the book is the last half, when Tolkien has reached the battlefields in France. Garth seems here on much surer footing than in cataloguing schoolboy dreams and youthful self-importance. The writing style throughout has an unfortunate bit of breezy overstatement to it, particularly in the swaggering prologue which meanders around Tolkien's rugby companions in 1913 to lead up to the melodramatic point of how happy these boys were before the War changed everything. But these are minor cavils. Tolkien and the Great War is a fine supplement to the basic account of Tolkien's life as told by Humphrey Carpenter in his authorized biography. It augments Carpenter's book in many ways, and presents new details as well as interpretations that extend Tom Shippey's view, in J. R. R. Tolkien: Author of the Century, of Tolkien as a writer traumatized by war. Anyone interested in how Tolkien's mythology began will find Garth's book an essential account. By its title alone, I really didn't know what to expect from George Beahm's The Essential J. R. R. Tolkien Sourcebook: A Fan's Guide to Middle-earth and Beyond ($18.99 New Page Books oversize paperback, ISBN 1564147029). But I was pleasantly surprised by it. I'm still not sure that the title or subtitle really does justice to the book, but I couldn't think of any alternatives either. It's basically a kind of guidebook to Tolkien-related products, from books and artwork, to journals, games, miniatures, etc. There are fourteen chapters, with six appendices. Here is a rundown of the coverage in brief: books by and about Tolkien, visual and audio adaptations, printed products (posters, calendars, etc), replicas of the One Ring, movie collectibles, gaming and miniatures, etc.--and it moves on from there to have interviews with some Tolkien artists, and appendices about other artists like Ted Nasmith, sections on Tolkien sites to visit in England, in New Zealand, and on the web. and Wrongs," which deals with some of the complexities of who owns rights to what, the differences between Tolkien Enterprises and the Tolkien Estate (no, they are not the same thing), and what is legal and what is not. Of course this isn't the type of book that one sits down to read cover to cover, but rather it is one for repeated browsing. And it's very good for that purpose. Its one flaw is that all of the illustrations are in black and white. For photographs of book covers, artwork, and miniatures, this is disappointing. And more so with the artwork by Tim Kirk and others, which is reproduced too small to really appreciate. There is another book from a few years ago that is a good complement to The Essential J. R. R. Tolkien Sourcebook, and that is Treasures from the Misty Mountains: A Collector's Guide to Tolkien by James H. Gilliam ($30.95, Collector's Guide Publishing trade paperback, ISBN 1896522769). 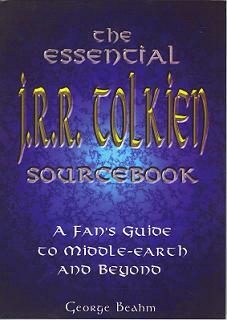 While the content of The Essential J. R. R. Tolkien Sourcebook leans heavily towards text, that of Treasures from the Misty Mountains leans as heavily in the other direction--with lots of color pictures of book covers, calendars, miniatures and film-related collectibles (but little artwork per se beyond covers). Neither book is perfect, and of the two, The Essential J. R. R. Tolkien Sourcebook has much more information, but both are nice additions to one's Tolkien bookshelves. Another fine item that snuck out with the fall Christmas books is The Maps of Tolkien's Middle-earth, by Brian Sibley and John Howe ($29.95 ISBN 061839110X), published by Houghton Mifflin. It's a clever package of a slipcase enclosing one book and one book-sized protective cover, the latter designed to look and open like a book, containing four large poster-sized folded maps. 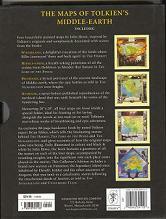 The four maps are of the Wilderland (from The Hobbit), of Middle-earth as a whole, of Beleriand, and of Númenor. Three of these were previously issues as small folded packages. The Númenor map is new to this collection. Both the books and the maps feature artwork by John Howe, who needs no introduction here. Fine work it all is. And the text in the book is by Brian Sibley, telling the stories of the original maps (as created by Tolkien himself), and providing glossaries to the names and places on each map. All in all, this is a choice and well-made collection, making an excellent companion to Tolkien's writings. 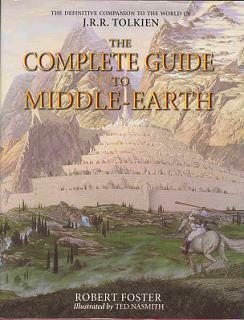 Of all the guide books out there to Middle-earth, the one that has always seemed to me the best and most reliable is Robert Foster's The Complete Guide to Middle Earth. And why do I think it this? Because it most closely follows the information given by Tolkien himself, without moving into the realm of speculation, and because, hallelujah!, it gives page references for where in Tolkien the information comes from. Well, the best just got better-- in England at least. HarperCollins of London has published The Complete Guide to Middle-earth (�30.00 ISBN 0007169426) in a sumptuous version with fifty full-page color illustrations by the renowned Canadian Tolkien artist Ted Nasmith. This collects illustrations from calendars and from Nasmith's illustrated edition of The Silmarillion. The marvelous illustrations are well reproduced too. What makes this version additionally attractive is that it is designed as a companion volume to the excellent three-volume Alan Lee illustrated edition of The Lord of the Rings ($80.00 ISBN 0618260587), which came out in 2002. The page references have been updated to refer to the latest editions of Tolkien's books, and there are eight pages of "Notes on the Illustrations" at the end of the book by Ted Nasmith. Here the artist writes illuminatingly of his views on his own artwork, and on such testy topics as the vexed do-balrogs-have-wings question. This edition has only been published in the UK, evidently for reasons of rights. There is a fine US hardcover, but it is without illustrations. 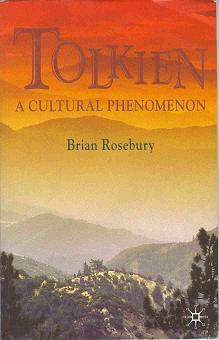 Brian Rosebury's study of Tolkien first appeared in 1992 as Tolkien: A Critical Assessment. It is a slim book, covering Tolkien in four chapters. It now re-appears in a revised and expanded form, adding two completely new chapters, under the slightly different title Tolkien: A Cultural Phenomenon. It is available both in hardcover ($59.95 ISBN 1403915970) and trade paperback ($19.95 ISBN 1403912637), published by Palgrave Macmillan. I have long thought that Paul H. Kocher's 1972 book, Master of Middle-earth (reissued last year by Ballantine in trade paperback, $12.95 ISBN 0345465601), was one of the best general introductions to Tolkien. Too bad Kocher never revised the book after so much newly-published Tolkien writings appeared in the 1980s and 1990s. Brian Rosebury's new edition of his own book may not supplant Kocher, but it fits alongside it well and puts Tolkien in a more modern context. 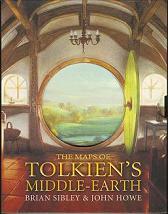 Rosebury concentrates on Tolkien's masterpiece, The Lord of the Rings, giving it coverage over the first two chapters. Discussion of everything else basically gets lumped into one chapter called "Fiction and Poetry 1914-1973." Here Rosebury shows a much better understanding and appreciation of Tolkien's poetry than some other critics, but he seems to view The Hobbit as such a minor work that it is only interesting as a dry run or as "an indispensable rehearsal for the huge narrative labour of The Lord of the Rings." Surely it is more than just that. And while Rosebury covers some of the material published in the History of Middle-earth series, he doesn't seem very interested in it. What Rosebury chooses to cover, however, is almost always interesting and thoughtful. His chapters on "Tolkien and the Twentieth Century," "Tolkien in the History of Ideas," and "The Cultural Phenomenon," move away from Tolkien's texts themselves and into a cultural examination. He ends with an appraisal of both the strengths and weaknesses of Peter Jackson film adaptations. Tolkien: A Cultural Phenomenon is a welcome addition to the small shelf of essential Tolkien criticism.